Well, we are in Scotland after the worst drive over ever, I have left my new apartment half unpacked, I have yet to hand-over the old apartment and things are just plain nuts. My father-in-law is very ill and that meant a mad dash across to get here, we are still waiting to speak to the consultant, so things are pretty much still up in the air. It did mean in my haste to pack and leave, I arrived with not much knitting which meant I did need to buy some yarn! Luckily my brother-in-law and his girlfriend are expecting a baby so some baby knitting was in order. I bought wool to knit 3 or 4 things from a Debbie Bliss book, that I can’t find a picture of, so take my word for it, its very cute. So far I have managed to catch up with India and spent a lovely day hanging out, sewing and spinning, yep I had my first spinning lesson and I am hooked, it was amazing. I don’t have any photos and my first yarn is far from perfect but I love it. 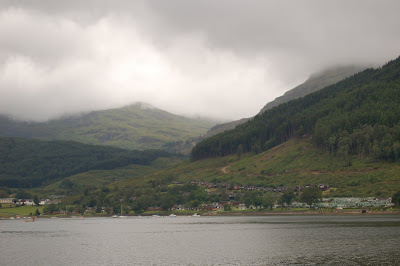 I still have lots to fit in including a trip to Coldspring on my way back through England, anyone been there recently? You’ll soon be spinning, and knitting up your own yarn! Glad to hear India’s got another knitter hooked on spinning, it is a very therapeutic pastime. Yikes. I hope things settle down for you soon! From little acorns, mighty oaks grow.